In 30 minutes, you'll complete a biceps, triceps, shoulder, and cardio workout. All you need is a pair of dumbbells and an adjustable bench. As President of Twinlab Sports Nutrition, I lead a busy life that involves a lot of travel. Occasionally, I'm forced to use hotel gyms with limited equipment, so I have to adjust my training. I need to make the best use of my time and the best use of the equipment available. My primary goal is to maintain a high level of training intensity. If heavy weights aren't available, I dial up my workout with speed and high volume. I push my body to the fullest and get back on the road. No excuses. This workout quickly torches your biceps, triceps, and shoulders—the entire arm. The limited-rest trisets and dropsets utilize a high amount of volume to hit every rep in the workout—as well as the cardio—in less than 30 minutes, engorging each muscle and making the most of limited time and equipment. The first time you go through it, you might not be able to pull it off in 30 minutes. Just run through the whole workout, get it down pat, work on your speed, and get it done as quickly as you can to keep up the intensity. An MVP is a passionate, motivated visionary, both in and out of the gym. From the men and women who put their lives on the line to protect their country, to the average Joe who works as hard at his entry-level job as he would his dream job, there are MVPs in all walks of life. Even the seasoned lifter who helps out the new kid at the gym is an MVP. Achieving MVP status is about overcoming any excuse and never accepting less than the best from yourself. In the gym, an MVP goes above and beyond to turn every workout into a muscle-burning challenge. This no-excuses workout lives up to the MVP standard. It hits your arms hard and fast. Push each arm exercise to complete physical failure, stare defeat in the eye, and finish! If you consistently force your body to this level, you, too, will be on the path to achieving MVP status. 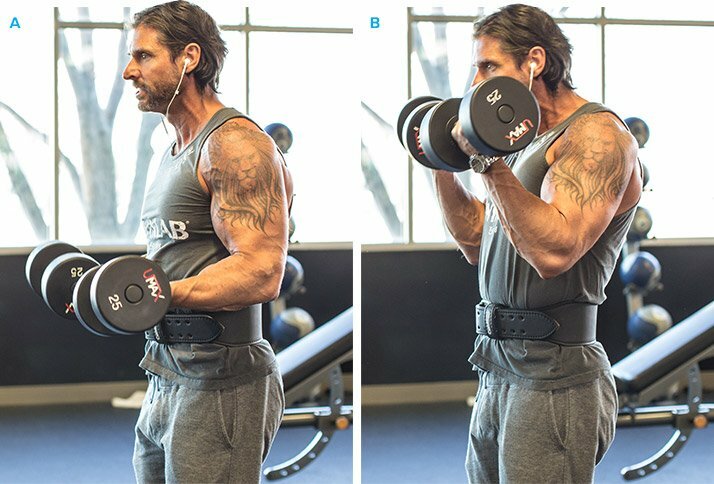 For the double-arm biceps curl, I employ the 21 method. First, perform 7 reps of the lower half of the biceps curl. Next, perform 7 reps of the upper half of the movement. Finally, perform 7 reps of the complete range of motion. After performing all 21 reps, rest 10-15 seconds. Do this for a total of 5 sets, dropping the weight each round. When you first start out, it's not that tough, especially with a 50 percent contraction movement. But it becomes tougher as you get further into the workout, even as the weights come down. Push through physically. Challenge yourself mentally. The trisets consist of three exercises in succession, with no rest in between. Move as quickly as possible, and decrease the weight after each triset. Use limited equipment, to simulate challenging situations like hotel gyms. Start with dumbbells to do skullcrushers (lying dumbbell triceps extensions). 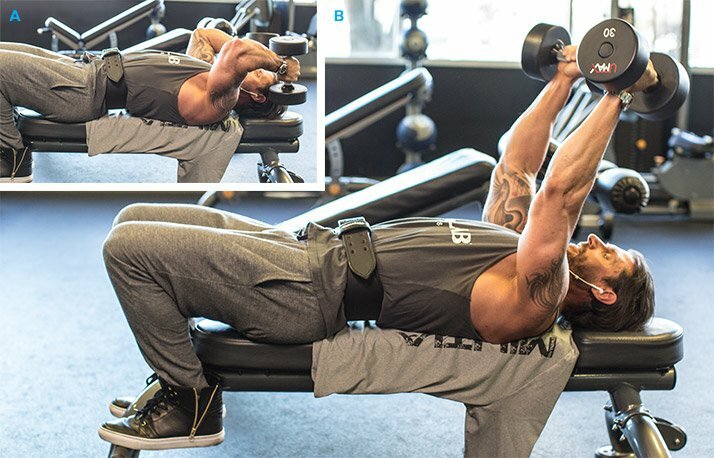 After the first set, slide over to an incline bench without rest for the Tate press; use the same dumbbells to save time. The neutral grip and inward rotation on the Tate press works a different head of the triceps. Don't have a barbell in your lifting area? The close-grip press can be modified as push-ups on a bench. Keep the hands close together and finish. 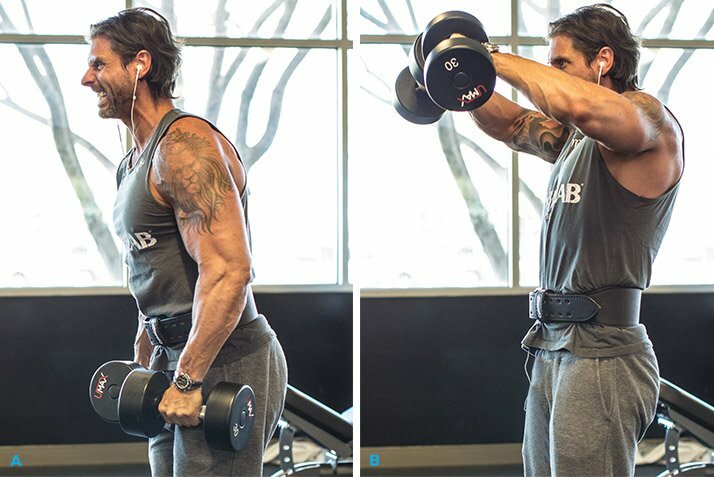 You won't have much left for this exercise, even when you're using 10-pound dumbbells for the presses. You'll have to move quickly to get this done in 30 minutes. Use the same dumbbells for all three exercises, and don't rest between exercises. You can stand in one place for all three parts of the triset.